Gökçen K, Gökçen G, Kordan Y, Kıraç E, Dündar G, Gültekin E. Antegrade stent placement in laparoscopic upper urinary tract surgery. Is there an easy way?. Videosurgery and Other Miniinvasive Techniques. 2018;14(1):102-106. doi:10.5114/wiitm.2018.77260. Gökçen, Kaan, Gökhan Gökçen, Yakup Kordan, Emre Kıraç, Gökçe Dündar, and Emin Yener Gültekin. 2018. "Antegrade stent placement in laparoscopic upper urinary tract surgery. Is there an easy way?". Videosurgery and Other Miniinvasive Techniques 14 (1): 102-106. doi:10.5114/wiitm.2018.77260. Gökçen, Kaan et al. "Antegrade stent placement in laparoscopic upper urinary tract surgery. Is there an easy way?." Videosurgery and Other Miniinvasive Techniques, vol. 14, no. 1, 2018, pp. 102-106. doi:10.5114/wiitm.2018.77260. Laparoscopic upper urinary tract procedures are frequently used today in the treatment of uropathologies that cause obstruction of the upper urinary tract such as ureteropelvic junction obstruction (UPJO) and middle-upper ureteral stones. Although extracorporeal shock wave lithotripsy (SWL) and ureteroscopic lithotripsy are the recommended first-line treatments especially for patients with proximal ureteral stones, in the case of patients with large ureteral stones where the treatment has failed, laparoscopic ureterolithotomy is applied as an alternative to open surgery procedures [1–3]. Being one of the most important causes of antenatal hydronephrosis, UPJO is encountered twice as frequently in male newborns as in females and has a total incidence rate of 1/1500 . Although laparoscopic dismembered pyeloplasty and open pyeloplasty demonstrate similar rates of success in the treatment of UPJO, the laparoscopic technique is a safe, minimally invasive treatment modality that results in lower complication rates, shorter hospitalization time, and less postoperative pain, as well as better cosmetic outcomes [5–7]. Passage of urine following upper urinary tract surgery is achieved by external drainage methods in which a nephrostomy tube is inserted or internal drainage methods where ureteral stents such as the D/J stent are placed. D/J stent use, which is frequently preferred in laparoscopic upper urinary tract (LUUT) surgery, provides advantages such as the prevention of transient ureteral obstruction caused by ureteral oedema and haematoma and the avoidance of anastomotic urinary leaks . Most of the time, the antegrade placement of double J stents in the laparoscopic technique is considered a challenging and time-consuming process by surgeons due to limitations regarding the flexibility of the stent, the curving of the distal tip of the stent, and the restricted bending angle of the laparoscopic equipment. A limited number of modifications have been developed in order to overcome these limitations and make the antegrade stent placement procedure easier and more practical. In this study, the results of the antegrade D/J stent placement method by means of Amplatz renal dilators that we used during LUUT surgery performed on both adult and paediatric case groups are reported. A total of 42 patients with 13 in the paediatric age group who had been treated between May 2015 and December 2017 by the transperitoneal method of LUUT surgery in which D/J stents had been antegradely placed in all cases were retrospectively evaluated. All of the child patients underwent laparoscopic dismembered pyeloplasty. Of the 32 patients who underwent laparoscopic Anderson-Hynes dismembered pyeloplasty, 13 were paediatric and 19 were adult patients, and the remaining 10 adult patients had their middle and upper ureteral stones treated with laparoscopic ureterolithotomy. The LUUT procedures that were performed at the Cumhuriyet University Health Services and Research Hospital were performed by a single surgeon (K.G.) after obtaining written consent from the patients. All LUUT procedures were performed under general anaesthesia by the transperitoneal method in the lateral decubitus position at 60° following the administration of single dose antibiotic prophylaxis. In child patients, following the placement of a 5 mm camera trocar by the open technique through the umbilicus, two 5 mm working trocars were inserted. In adults, a pneumoperitoneum was created by CO2 insufflation using a Veress needle and a total of three ports were used, which comprised a 10 mm camera port, and one 10 mm and one 5 mm working trocar. An additional 5 mm trocar was placed for the purpose of retraction when necessary. The antegrade D/J stent placement procedure was performed following the completion of the anastomosis of the posterior suture line in the laparoscopic dismembered pyeloplasty operation, and following the extraction of the stone through the ureterotomy incision in the laparoscopic ureterolithotomy procedure. The closed end of the 4 Fr D/J stent used in paediatric patients and 4.8 Fr D/J stent used in adult patients was advanced into the bladder through the proximal ureter with the help of 10 Fr or 14 Fr Amplatz dilators passed through the trocar. In case of difficulties in the placement of the distal tip, it was attempted to advance the distal tip into the bladder by retracting the guidewire within the D/J stent for about 1 cm and loosening the distal tip. The guidewire inside the D/J stent and the Amplatz dilator used to help guide the stent were removed through the trocar, and the proximal tip of the stent was advanced up to the pelvis with the help of a grasper under laparoscopic vision (Photo 1). After the conclusion of the ureteral stent placement procedure, the anastomosis of the anterior line in pyeloplasty and the closure of the ureterotomy incision in ureterolithotomy were completed. The duration of antegrade D/J stent placement, the time between the introduction of the D/J stent through the trocar within the Amplatz renal dilator and the completion of stent placement, was retrospectively calculated based on visual records. In the intraoperative period, the precision of the D/J stent placement was not verified with any radiological methods. All patients underwent kidney ureter bladder (KUB) radiography on the 1st postoperative day and the placements of the stents were verified. In all cases, the Foley catheter was removed on the 2nd postoperative day, and the drains were removed when they receded below 30 ml and the patient was discharged. The D/J stents were removed at the 4–6th postoperative week; all patients were requested to have urinary tract ultrasonography done in the 3rd postoperative month and the patients who underwent pyeloplasty were asked to present for a follow-up examination in the 6th postoperative month with MAG-3 renal scintigraphy results. Of the total 42 patients who underwent LUUT surgery, 31 were male and 11 were female. Thirteen patients were in the paediatric group and were treated with laparoscopic pyeloplasty, and of the remaining 29 adult patients, 19 underwent laparoscopic pyeloplasty and 10 laparoscopic ureterolithotomy. The mean age of the child patients was 6.8 ±5.1 years (10 months to 16 years) with 2 in the infant group. The mean age of the adult patients was 40.5 ±14.3 (19–68). The mean operative time for all cases was 126.9 ±33.5 (70–200) min; and intraoperative complications or a need for conversion to open surgery were not encountered in any patients. The average amount of blood loss during surgery was 28.2 ±21.6 (10–105) ml and none of the cases required intraoperative erythrocyte transfusion. The duration of laparoscopic antegrade stent placement was calculated as 2.61 ±0.8 (1.5–5) min. The antegrade D/J stent placement procedure was performed according to the described laparoscopic method in all cases and no additional manoeuvres or interventions were needed. The mean follow-up period was calculated as 17.4 ±11.3 (1–35) months. The transperitoneal approach was preferred in all cases except in 2 cases of middle ureteral stones that were performed by a retroperitoneal approach. The preoperative, intraoperative, and postoperative demographic data of all cases are presented in Table I. It was determined on the first postoperative day, when the D/J stents of the patients were checked with KUB, that the distal end of the stent had not entered the bladder only in one of the paediatric cases. The D/J stent was replaced with ureteroscopy retrogradely on the third postoperative day in consequence of abdominal pain being reported by the child and 300 ml of urine leakage through the drain per day. The mean hospitalization time was calculated as 2.8 ±0.9 (2–5) days for all patients. Deterioration of hydronephrosis or kidney function was not encountered in any patients in the follow-up period. 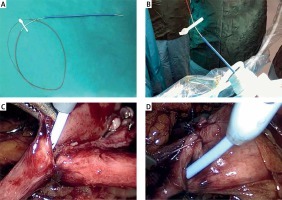 In parallel to the development of minimally invasive methods, the laparoscopic dismembered pyeloplasty technique has been a preferred method in recent years as it produces success rates comparable to open surgery in all patient groups . 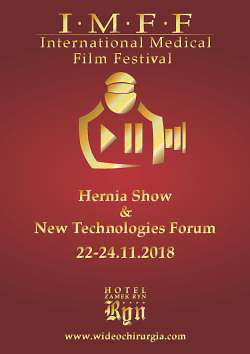 Similarly, laparoscopic ureterolithotomy is considered an effective method with successful results especially in the treatment of cases of large impacted proximal and middle ureteral stones, where it is used either primarily or after unsuccessful SWL and ureterorenoscopy procedures [9, 10]. Although there have been reported studies focusing on the route and implementation of ureteral stent placement with the increasing popularity of the antegrade and retrograde techniques, a consensus on which method is more convenient and ideal has not been reached yet. While it has been reported in studies conducted on the route of ureteral stent placement that the retrograde placement of the D/J stent prolonged the duration of the surgery due to the need to reposition the patient, there have also been contrasting reports suggesting that the retrograde placement was more successful and had lower complication rates [11–13]. Another subject of discussion regarding the retrograde placement of the D/J stent is whether it should be done before or after the pyeloplasty procedure. While the presence of a stent placed prior to laparoscopic pyeloplasty hinders dissection as it drains the renal pelvis and obstructs the ureteral spatulation and suturing, stents placed postoperatively may come out from between the sutures on the anastomosis line . Various modifications have been developed over time in order to overcome the difficulties associated with antegrade stent placement and its time-consuming properties; however, most of those have described a necessity for an additional intervention using a chiba needle, angiocatheter, or innovative instruments [15–19]. No additional interventions were needed in the placement of stents that we applied in our study by means of Amplatz dilators and the dilators were inserted through the existing cranial trocar. Other advantages of this technique are that it allows easier manipulation of the tip of the stent, offers simpler implementation, does not require fluoroscopic control, and that preoperative cystoscopy is not performed. A similar technique has only been described in cases of laparoscopic pyeloplasty performed on child cases, and resembling our study, the described technique was shown to be feasible with quick implementation . However, unlike the described study, it was implemented in both adult and paediatric cases and in all LUUT procedures in our study. The transperitoneal approach was preferred in all cases except two. This decision was based on our clinical experience and provided convenience in the antegrade placement of stents by offering a large area. Approaches such as infusing the bladder with methylene blue or similar substances, or checking with ultrasonography to confirm the placement of the distal tip of the stent, were not deemed necessary. In case of difficulties in advancing the closed distal tip of the stent or if it appeared to be stuck, advancing into the distal tip was continued by lightly pulling the guide back within the stent and softening its tip. It was determined in only 1 case that the stent had not entered the bladder and had been dislocated. Gas leakage was minimized by using a 14 Fr for the 4.8 Fr D/J and a 10 Fr for the 4 Fr D/J. Amplatz dilators, which can be found in almost all clinics offering endourological procedures, provide convenience and eliminate the difficulties encountered during the antegrade utilization of the D/J stents used in LUUT procedures to increase the durability of the anastomosis and prevent extravasation. The limitations of our study can be summarized as the absence of randomization with a control group and other techniques, and our short follow-up time. Future studies carried out with a greater number of cases and a control group will be valuable for revealing the success and reliability of this technique.